Citation: Hawaelrasoul BA, Alsahari A, Elwy A. Late presentation of anomalous origin of the left coronary artery from the pulmonary artery (ALCAPA) was confused with coronary artery fistula. Ann Cardiovasc Thorac Surg. 2018;1(3):76-80. 8 years old Saudi female from outside Riyadh, previously well, and medically free apart from bronchial asthma (controlled on Ventolin and Fexitide). She started to have awareness of her heart beats. She was evaluated in another cardiac center by ECG, CXR, and echocardiography and diagnosed as coronary artery fistula from RCA to the right ventricle and referred to our center for the possible transcatheter closure of the coronary fistula. She was asymptomatic, clinically stable, well-built weight on the 75th percentile, saturation 99% on room air, there is ejection systolic murmur at the left sternal border. Chest X-ray demonstrated no cardiomegaly or lung congestion. ECG showed sinus rhythm, heart rate within the normal limit for her age (80 beats per minutes), no signs of ischemia (Figure 1). Figure 1: Sinus rhythm, no deep Q wave in lead 1, aVL, V5 or V6, and no ST segment changes. 24 hour Holter monitoring showed normal sinus rhythm, maximum heart rate of 152, minimum heart rate was 53 and average heart rate was 79 beats per minutes and no documented ventricular or supraventricular ectopy. Echocardiography showed: large coronary fistula seen in MPA. LCA origin was not clarified. Mild left atrial enlargement. Moderately dilated left ventricle, there was trivial mitral regurgitation with good left ventricle systolic function. Some coronary collaterals saw in the anterior interventricular groove. Further imaging was recommended is to clarify coronary anatomy (Figures 2-5). The case was discussed in the cardiology meeting next day and there was a large debate about is it coronary fistula or ALCAPA. 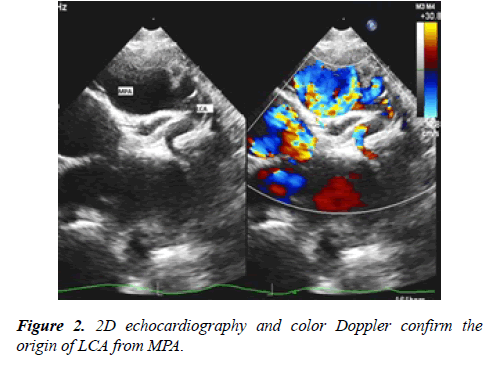 Figure 2: 2D echocardiography and color Doppler confirm the origin of LCA from MPA. 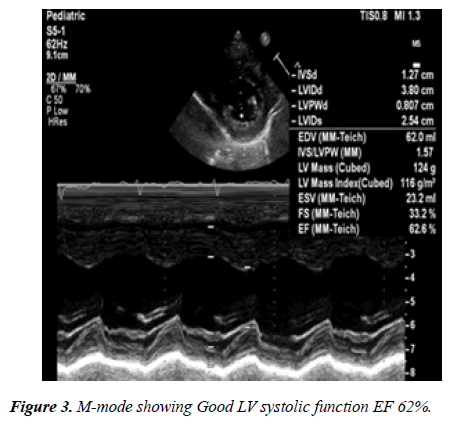 Figure 3: M-mode showing Good LV systolic function EF 62%. Figure 4: 3D-echo showing good LV function with no regional wall abnormality. 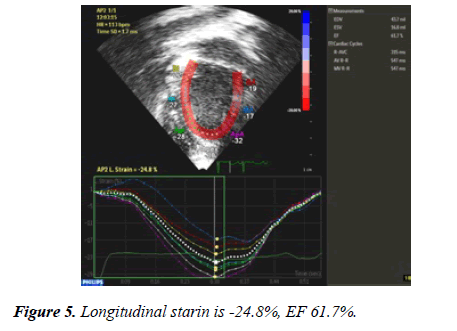 Figure 5: Longitudinal starin is -24.8%, EF 61.7%. Next day the patient was taken to the catheter laboratory and selective coronary angiography showed dilated RCA with multiple collaterals supplying the LCA which drain retrogradely to the MPA (Figures 6 and 7). 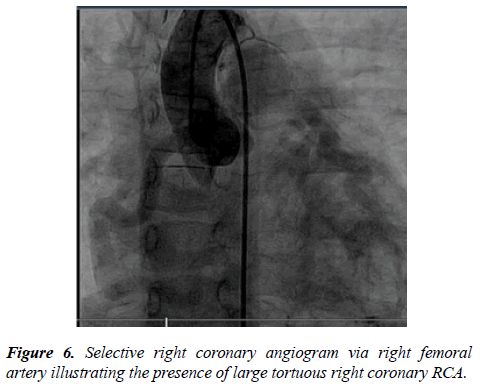 Figure 6: Selective right coronary angiogram via right femoral artery illustrating the presence of large tortuous right coronary RCA. 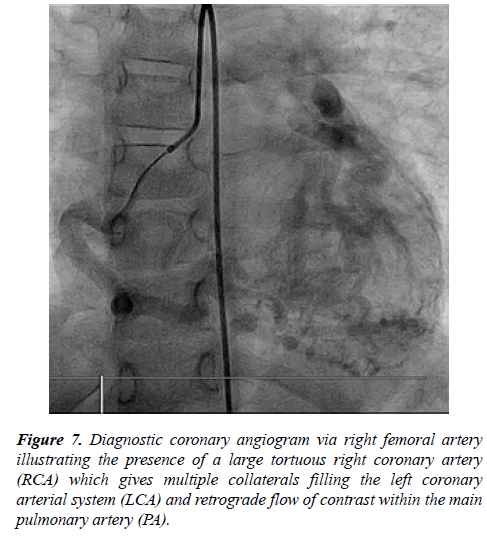 Figure 7: Diagnostic coronary angiogram via right femoral artery illustrating the presence of a large tortuous right coronary artery (RCA) which gives multiple collaterals filling the left coronary arterial system (LCA) and retrograde flow of contrast within the main pulmonary artery (PA). Hemodynamics showed:- QP: QS was 1.5:1. Pulmonary vascular resistance (PVR=1) wood unit, Cardiac Index (CI) 9.7 litres/minute/m2. Right Pulmonary artery pressure 19/12 mmHg with a mean of 16 mmHg. LV end-diastolic pressure 10 mmHg and RV end-diastolic pressure 8 mmHg, systemic right femoral pressure 94/55 with a mean of 71 mmHg. After confirmation of diagnosis, surgery was done on the same admission by coronary artery implantation through median sternotomy pericardium opened after heparinization, the aorta and double stage cannulation were done, bypass commenced and patient gradually cooled down to 28-degree centigrade. Aorta was cross-clamped and heart cardioplegia, LV vent was inserted through a right upper pulmonary vein. MPA was transected near the confluence. LCA button harvested and mobilized then re-implanted to the aorta, the aortic clamp was removed after careful de-variation. The heart was beating in sinus rhythm, PA reconstructed with a pericardial patch. The patient came out of bypass easily on moderate inotropic support, the heart was decannulated and hemostasis was secured. The chest was closed with 2 pleuro-mediastinal drains. Intraoperative transesophageal echocardiography showed patent coronary arteries with good LV systolic function. The patient was shifted to surgical ICU in stable condition with the good postoperative course. On clinical follow-up, she is completely asymptomatic, last echocardiography showed normal left ventricle dimension, trivial mitral regurgitation, and good left ventricle function. ALCAPA is a very rare congenital cardiovascular defect with an estimated incidence of one in 300,000 live births; however, this may be an underestimated considering patients may die prior to diagnosis. The true incidence of older patients is not known, with only a few case reports of patients older than 50 years of age . The true incidence of older patients is not known [2,3]. It is unusual for an ALCAPA patient to survive to adulthood, however, the oldest reported patient with ALCAPA to undergo corrective surgery was a 79-year-old woman presented with a 3-months history of worsening shortness of breath and orthopnea . Invasive coronary angiography is recognized as the “gold standard” for the diagnosis of coronary artery disease because of its excellent spatial and temporal resolution. Diagnostic cardiac catheter with coronary angiogram illustrated enlarged right coronary artery, which provides retrograde collaterals to supply the left ventricle then preferentially directs into the lower pressure pulmonary artery system causing coronary steal phenomenon. Few patients who survive through adulthood without surgery must have abundant, well-formed functioning collaterals with adequate perfusion of the left ventricle . Multislice Computed Tomography (MSCT) is a non-invasive imaging tool that allows accurate, non-invasive diagnosis of ALCAPA, it has been increasingly used to assess the coronary anatomy. In recent years with very good diagnostic accuracy and is considered a reliable alternative to invasive coronary angiography for diagnostic evaluation of the coronary anatomy . However, ECG gating of the scans requires heart rates to be relatively slow and there remains a degree of radiation exposure with this technique, which is difficult in children even with the assistance of B-blocker therapy as used in adult patients. Echocardiography with Doppler color flow mapping has replaced cardiac catheterization as the standard method of diagnosis . An enlarged RCA should also raise the suspicion of the diagnosis. Echocardiography also will show the size and function of the cardiac chambers, particularly the left ventricle, as well as regional left ventricular wall motion abnormalities and mitral regurgitation. There may be increased echogenicity of the papillary muscle and adjacent endocardium due to fibroelastosis. The typical and direct echocardiographic feature of ALCAPA is the ostium of the LCA originating from the pulmonary artery in parasternal short-axis view. It is difficult to distinguish LCA originating from the pulmonary artery or the aorta based on anatomical image analysis, because the LCA is close to the aorta, and sometimes it even crosses through the aortic wall in patients with ALCAPA. The blood flow in the abnormal vessel from the pulmonary trunk is in the opposite direction of normal LCA and this is prominent in the diastolic phase. In some cases, the two branches of LCA and retrograde flow can be visualized. However, when visualizing a dilated RCA and diastolic or continuous retrograde flow from the abnormal vessel into the main pulmonary artery, can be misdiagnosed as RCA to pulmonary artery fistula . In our patient she was completely asymptomatic, thriving well apart from dyspnea on moderate exertion and palpitation which can be explained by uncontrolled bronchial asthma, which led her to seek medical advice. She has no chest pain or signs of ischemia on ECG (Absent typical signs of ischemia-deep Q wave in lead 1, aVL, V4 and V6 on ECG). Initial evaluation in other cardiac center suggest right coronary fistula to the right ventricle and referred to our center for diagnostic cardiac catheterization and possible closure of the fistula. Our initial transthoracic echocardiography showed dilated right coronary artery, left coronary artery not seen, good left ventricle systolic function, trivial mitral regurgitation. There was debate among cardiologist about initial diagnosis and some cardiologist raise the possibility of ALCAPA; all agree to go for cardiac catheterization for final diagnosis. ALCAPA is a rare condition that can be difficult to diagnose by echocardiography alone. It was clearly imaged in only 54% of echocardiographic examinations. However, other consistently identified echocardiographic markers were found, including left CA flow reversal (91%), collateral CA flow (85%), right CA dilation (81%), abnormal pulmonary artery flow (79%), mitral regurgitation (74%), left ventricular dysfunction (66%) and endocardial fibroelastosis (57%). Presenting echocardiograms had five of seven markers in 85% of patients. Left ventricular dysfunction was the most common marker in infants (89% vs. 38%, P=0.005); older children were more likely to have collateral formation visualized by color Doppler (100% vs. 75%, P=0.04). Following surgery, there were no early surgical deaths. The median follow-up duration was 10.3 years. At last follow-up, 92% had a normal left ventricular function, 3% had moderate or worse mitral regurgitation, and 17% had required re-intervention . Surgical correction is highly recommended as soon as the diagnosis is made, regardless of age. In adult-type ALCAPA originating from the right-facing sinus of the pulmonary artery, direct reimplantation of the ALCAPA into the aorta is the more physiologically sound repair technique to re-establish the dual-coronary perfusion system and is recommended. In our case surgery was done by coronary artery reimplantation in the aortic root during the same admission. Post-operative Transesophageal Echocardiography (TEE) showed normal antegrade flow in both RCA and LCA. Patient has smooth post-operative course and the patient is completely asymptomatic and following in outpatient clinic. Coronary re-implantation was effective for rebuilding a dual coronary system in patients with ALCAPA and resulted in progressively improved LV function and reduced functional MR. Echocardiography was valuable for evaluating the outcomes. LV function, the degree of MR, and possible complications could be detected with follow-up echocardiography . Despite normalization of left ventricular function after surgery, residual coronary lesions or myocardial fibrosis may be found. After LCA re-implantation, ALCAPA patients showed a residual sub-endocardial damage in LCA territories. Despite a normal systolic and diastolic function, the prevalence of residual coronary lesions was high. A mean longitudinal strain >-15% in LCA territories were able to identify those patients . After successful repair in asymptomatic ALCAPA patients, despite an LVEF >50%, diastolic function, LV longitudinal deformation, and LV torsion remain impaired. Di Salvo G and his colleagues suggest including a detailed study of the diastolic function and cardiac mechanics in the clinical follow-up of these patients to identify the subgroup of patients at higher risk . A high index of suspicion is needed to diagnose ALCAPA, some patient can be asymptomatic, and diagnosis can be late. Cardiac catheterization is the gold standard method for diagnosis of ALCAPA if transthoracic echocardiography is not clear. The authors would like to thank Dr. Salim Ahmad (Pediatric Cardiologist, PSCC) for his great effort in doing the transthoracic and 3D echocardiography. In addition, I would like to extend my thanks to Dr. Tariq Momenah Consultant Cardiologist and Head of Academic and Training affairs, PSCC. Yau JM, Singh R, Halpem EJ, et al. Anomalous origin of the left coronary artery from the pulmonary artery in adults: a comprehensive review of 151 adult cases and a new diagnosis in a 53-year-old woman. Clin Cardiol. 2011;34(4):204-10. Separham A, Aliakbarzadeh P. Anomalous left coronary artery from the pulmonary artery presenting with aborted sudden death in an octogenarian: a case report. J Med Case Rep. 2012;6:12. Fierens C, Budts W, Denef B, et al. A 72 year old woman with ALCAPA. Heart. 2000;83(1):e2. Chattranukulchai P, Namchaisiri J, Tumkosit M, et al. Very late presentation of anomalous origin of the left coronary artery from the pulmonary artery: case report. J Cardiothorac Surg. 2018;13(1):70. Frommelt MA, Miller E, Williamson J, et al. Detection of septal coronary collaterals by color flow Doppler mapping is a marker for anomalous origin of a coronary artery from the pulmonary artery. J Am Soc Echocardiography. 2002;15:259-63. Neves PO, Andrade J, Monção H. Coronary anomalies: what the radiologist should know Radiol Bras. 2015;48:233-41. King DH, Danford DA, Huhta JC, et al. Noninvasive detection of anomalous origin of the left main coronary artery from the pulmonary trunk by pulsed Doppler echocardiography. Am J Cardiol. 1985;55(5):608-9. Li RJ, Sun Z, Yang J, et al. Diagnostic value of transthoracic echocardiography in patients with anomalous origin of the left coronary artery from the pulmonary artery. Medicine (Baltimore). 2016;95(15):e3401. Patel SG, Frommelt MA, Frommelt PC, et al. Echocardiographic diagnosis, surgical treatment, and outcomes of anomalous left coronary artery from the pulmonary artery. J Am Soc Echocardiogr. 2017;30(9):896-903. Gao Y, Zhang J, Huang GY, et al. Surgical outcomes of anomalous origin of the left coronary artery from the pulmonary artery in children: an echocardiography follow-up. Chin Med J (Engl). 2017;130(19):2333-8. Di Salvo G, Siblini G, Issa Z, et al. Left ventricular mechanics in patients with abnormal origin of the left main coronary artery from the pulmonary trunk late after successful repair. Cardiology. 2017;136(2):71-6.